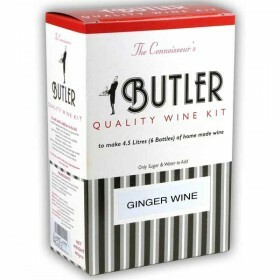 Butlers Ginger wine is a dessert wine of approximately 18% alcohol by volume (abv). It has been desi.. The Portavino produces 6 bottles of a heavy red wine, sweet, high in alcohol and in the style of Por.. The Butler Vermouth Bianco wine kit has been designed to replicate commercial dry vermouths such as ..